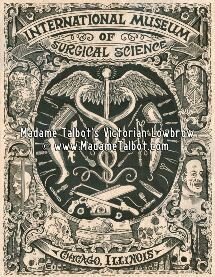 This exclusive IMSS Poster features many icons from the International Museum of Surgical Science exhibitions and collection. This poster is 17 inches wide by 22 inches high, generous black ink lushly printed on parchment stock. Hand drawn by Madame Talbot, designed and printed in USA.